When I have that piece of stone, I forget all I’ve learned and simply start carving. In the history of white Australian art, there have been few exceptional stone or wood carvers. Rosemary Madigan, now in her 85th year, is one of them, and the female torso is her great forte. As a 23-year-old in 1950 Madigan won the prestigious NSW Travelling Art Scholarship, which allowed her three years study in Europe. 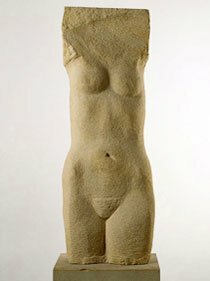 There, she met Henry Moore and studied the work of Picasso, Matisse and Modigliani, among others, but pursued more intensely the traditions of Romanesque sculpture through the churches and museums of England, France, Italy and Belgium. Sojourns in India – and the sensuousness, subtlety and stylisation of the three-dimensional art she encountered there – also had a profound impact.